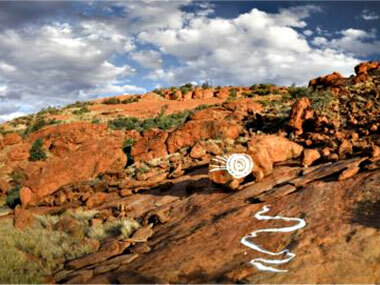 Most people know and happily accept that canvases by remote Aboriginal artists may look abstract but invariably involve a representation of parts of the Country that is so important to them....rockholes, food sources, ancestral Dreaming tracks, caves, saltpans, etc etc. And, of course, in Arnhemland and The Kimberley, caves themselves are full of paintings and stencils – mostly from the past – that are the source of so much 'art' today. But the advantage of a well-funded event like South Australia's Tarnanthi Festival is that artists can experiment with ideas that just aren't possible in the normal course of events; ideas that cost too much or ideas for which no financial return is possible. 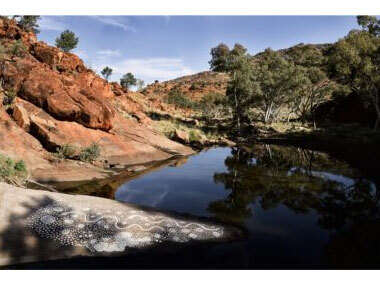 When Tarnanthi Artistic Director, Nici Cumpston decided to place an emphasis in this year's Festival on her own State's APY Lands artists, she jumped at the “ambitious idea'” from Tjungu Palya art centre artists in the Nyapari community to head out bush to important sites and actually paint on them, recording the effects in large photographs which would be displayed in Adelaide. Elder Keith Stevens explains: “This is a very old idea, an idea that came to us through our ancestors. I used to camp near these rockholes with my father and he told me 'Don't leave this ngurra/Country. It's up to you to stay and look after this Dreaming'. So, I was thinking I might show some of this special place and our stories and let people know how important these sites are for my family. I've been painting on canvas for a long time now, but back when there were no art centres, Anangu would paint with tutu/ochres that we find underground, we would paint on the land or on the body for inma/ceremony. Whitefellas are seeing all our work on canvas, but we want people to see the places that really are this Dreaming. Then you will see how much we love this Country and why we always want to stay here”. So – it was off to collect a mailbag full of white tutu rocks and bring them back to the art centre for 'young fellars' to grind down. Earlier generations used a range of colours for rock painting; but for the sake of effective photography, just white on the red rocks of the Centre made the best contrast. Then it was out to the sites, accompanied by the 'young fellars' to do a bit of fetching and carrying – and to learn the stories and songs that accompanied the painting. 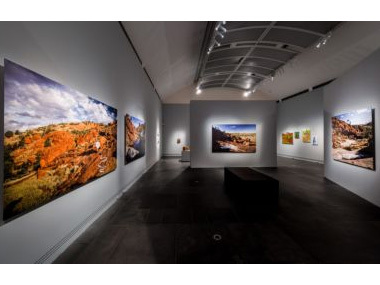 The photos (taken by Leopold Fiala) captured the new art in context – bare landscapes, ancient rocks, blue and clouded skies. “We wanted them to be big photographs”, explained Keith Stevens, “because where we did the painting was on really large rocks inside massive landscapes”. And fellow elder Bernard Tjalkuri added, “People in the cities might not know how big our Country is. Big sky, big rocks, big sand dunes – the desert is a big place, so maybe we have to see it big in a photo to understand what it's like out here....to feel what it's like to walk around in our Country”. And they've already got plans for the next Tarnanthi Festival. They want to make movies of big ceremonies/inma taking place in their communities; “One for Watarru, one for Kanpi and one for Nyapari”. All the children and families will be involved – again taking advantage of Tarnanthi's creative encouragement to keep the home fires burning and learning, and to educate the wider world in the essential priorities of these remote communities. The installation of 'Painting on Country' in the Art Gallery of SA for the second Tarnanthi Festival.